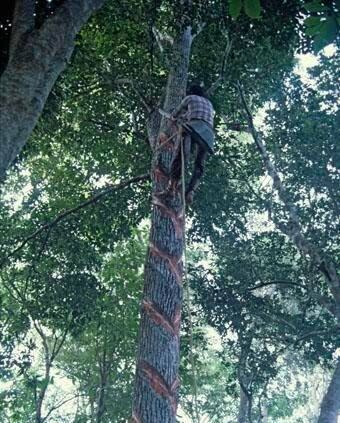 The Chiclero - once a thriving occupation practiced by men in Crooked Tree Village and the surrounding areas has slowly become extinct since the early seventies. Growing up, I can vividly remember my father took great pride in his work as a Chiclero. This line of work was done by the older generation of village men, who are accustomed to doing dangerous and arduous tasks to provide for their families. These men were predominantly farmers, who did not have much time for seasonal work such as this, as it would keep them away from their plantations. 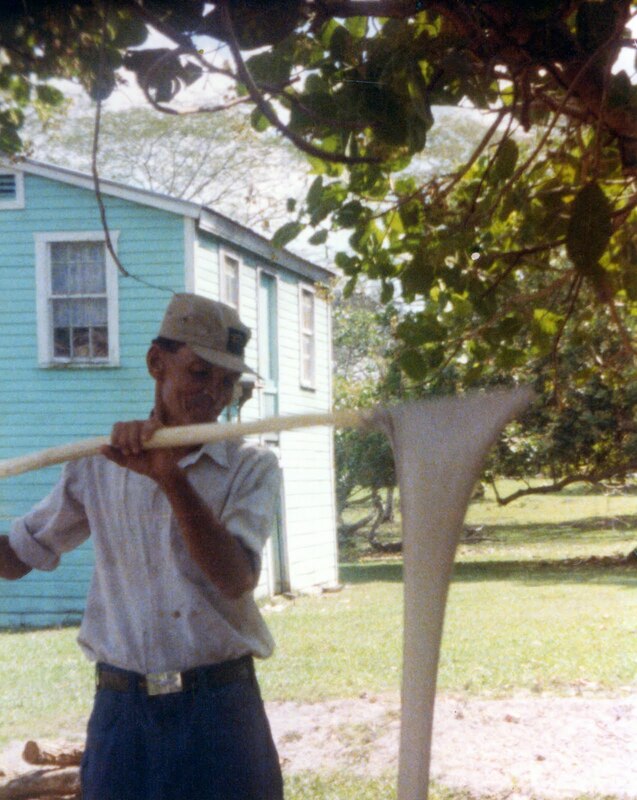 I grew up during the time when this occupation was phasing out, and had witnessed first hand how my father processed the milky, white sap from the sapodilla tree and transformed it into chicle, which was used as the main ingredient in chewing gum. 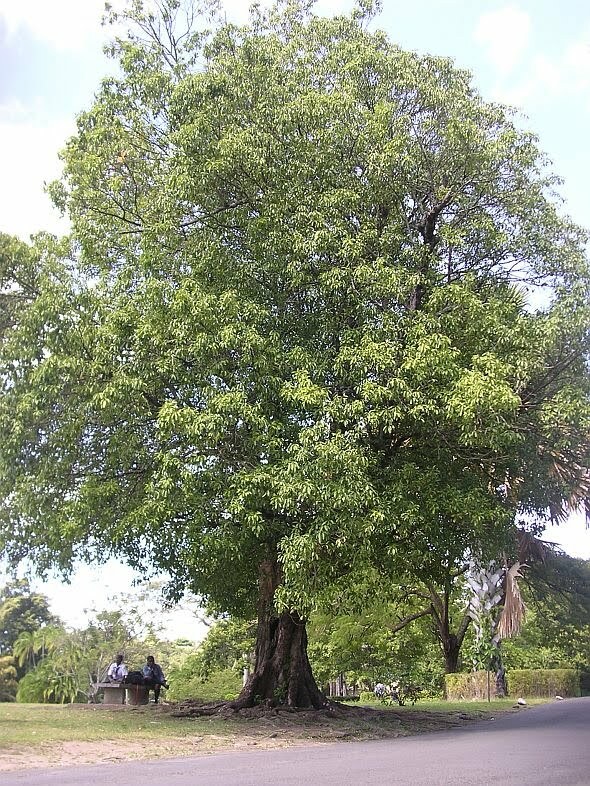 The sapodilla tree grows wild in the rainforests of Belize, especially around the vicinity of Crooked Tree Village. The men would be isolated at their camp sites for weeks at a time. 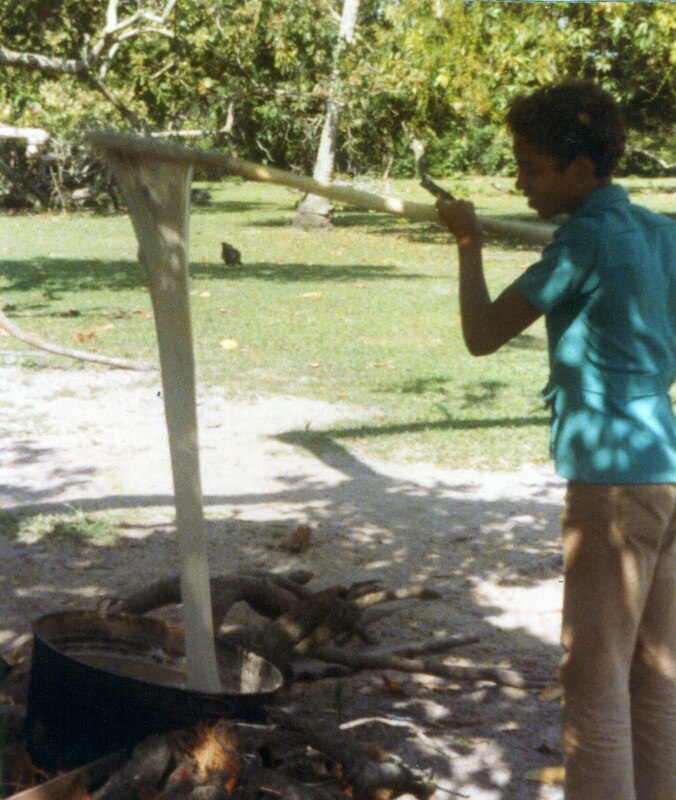 This would give them enough time to harness the milky sap from the Sapodilla tree in sufficient quantity before returning home to cook the milk into chicle form. Although, some men, like my father would prefer to 'camp-out' alone, others would set up camp with their friend(s) for safety purposes, since the wild life lurking in the forest includes tigers (Jaguars) and poisonous snakes. In preparation for the adventure, Chicleros would gather their tools of the trade, which includes a sharpened machete and file, different sizes of water proof canvas bags used to catch the milkly sap as it drains from the Sapodilla tree, specially made climbing spurs and back harnesses to facilitate climb, camping equipments and bedding, food and water gourds (tuck- tuck) that kept the water fresh and cool, a sixteen gauge shotgun and cartridges and last, but not least, the ever present green canvas shot bag, oil-painted, which makes it waterproof and is kept stacked with dried tobacco leaves, and white paper for them to roll their own (cigarettes) coloduro. The shot-gun was used for self-defense from the various wildlife they encounter, and for hunting wild animals and birds for food. 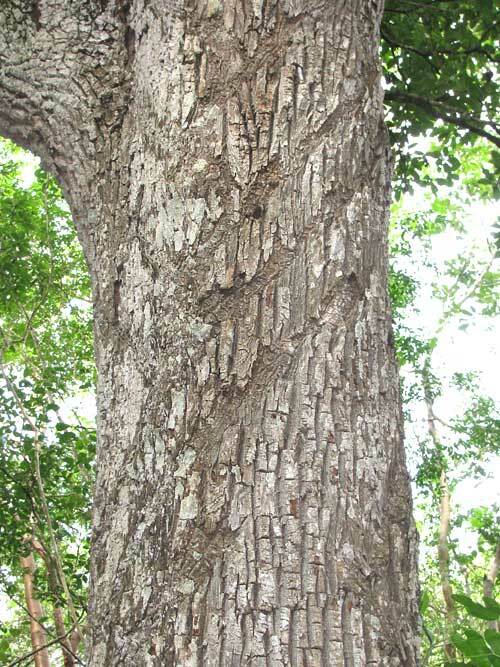 Chicle trees are easily recognized in the rainforests of Belize because of the deep zig-zagged demarcations that scar the huge tree trunks. 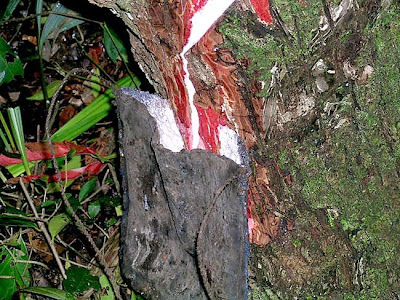 These marks are made by the Chiclero (trappers) as they harvest chicle sap; the original form of chewing gum. After setting up camp, the Chicleros' first task is to survey the area for large enough Sapodilla trees suitable for (bleeding) harnessing sap. He would then clear the lower trunk of the tree and carefully set his smaller canvas bags to catch the sap as it drain down the tree. Next, he straps on his pair of iron climbing spurs on both feet, fix his safety canvas harness around his back and the tree trunk to support his climb, then he skillfully precision his machete to carve out an inch-wide zigzag trail in the tree bark for the sticky sap to gently flow down into the catching bags below. The bags are left in place as the Chiclero moved on from one tree to another, repeating this same process. After enough sap is drained from the tree, the bags are removed and emptied out into larger holding bags then reused. 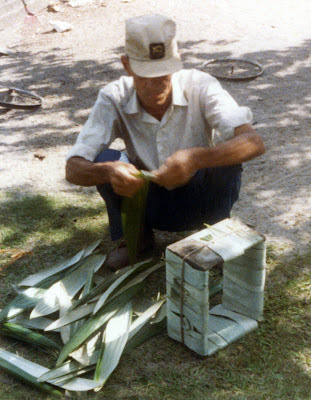 At the end of the camping period, the holding bags which are filled to the brim with milkly sap, like a cow's udder, is carried home for processing. My father used an open-mouthed, twenty-five gallon, round, black iron cauldron to cook the milky sap, which he processed into large fifty pound rectangular blocks of chicle. The cooking process is usually done outdoors, with the large pot resting on iron pegs firmly planted in the ground and allowing eight to ten inches for a fire to be built under the pot. The milk is poured inside the pot and has to be stirred constantly with a wooden paddle to avoid burning. As the cooking process progresses, the white milk becomes thicker, stickier and richer, and changes to a creamish-brown in color. 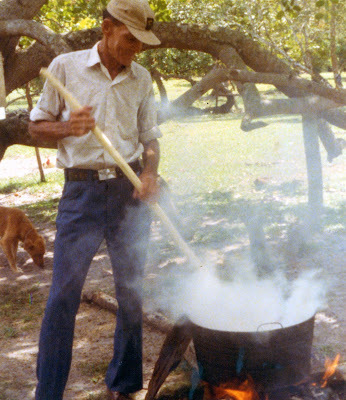 At this point, the rythmic stirring pattern changes to a regular slapping-like motion of the chicle against the side of the pot to ensure an even and uniform blend and to avoid scorching. After the cooking is completed, the packing process begins. Special molds are made from wood and leaves to facilitate the packaging process. These molds are usually rectangular in shape, approximately fourteen inches in length, twelve inches in width and ten inches in height, without a top, but with an unattached bottom. When stuffed with the hot or warm chicle product, a block would weigh between forty-five to fifty-five pounds. The inside of the mold has to be very smooth and wet, so that after the chicle has cooled down and solidified, with one fluid motion, it slides out easily into one block of chicle. The blocks of chicle are sold by weight and are exported to make chewing gum. Chicleros like my father used to add a special type of white marl (clay) to the pure chicle to increase the weight and quantity of chicle blocks. Some greedy Chicleros would sometimes add too much white marl, and the mix would crumble and become easily detected by the buyer who would reject it. The rejected chicle would have to be reworked and cooked in fresh batches. My father, a man of integrity, always maintained the right proportions of chicle and marl so it was never necessary for him to rework his supply. The cooked chicle was also very tasty, and as a child, we would pinch or bite off mouthfuls from the blocks, chew on them until our jaws are tired, and then stick them back on the blocks. The main vender who bought the chicle product from Crooked Tree Village was Mr. Mathias from Orange Walk Town, who was able to build a very good relationship with his customers because of his regular business trip to the village. 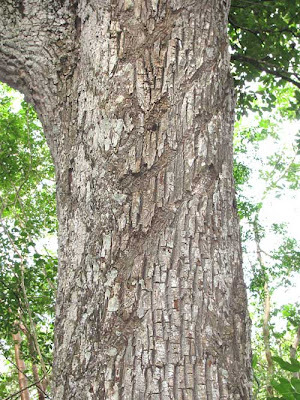 Chicle has been trapped from the sapodilla trees since the time of the ancient Mayas. Exports declined, however, when cheaper synthetics took over the market. The men in the village also used to prized the wood of the sapodilla tree, because of its tremendous strength and durability against the ever-present termites. Special thanks to Mrs. Dorothy Throne for the pictures. Mrs. Throne was a Wesleyan Missionary living in Crooked Tree Village for over a year in the 1970's. Keep up the good work Linda, you put Crooked Tree Village in the "Spotlight". Thanks for all your hard work. Very Good History Linda. My daughter was amazed at finding out for the first time as to where we used to get chewing gum. I enjoyed this article very much, took me back to the good ole days. A very God Job to your Guest Writer. Very enjoyable read. I learned something new about the Tillett family. So neat!!! !